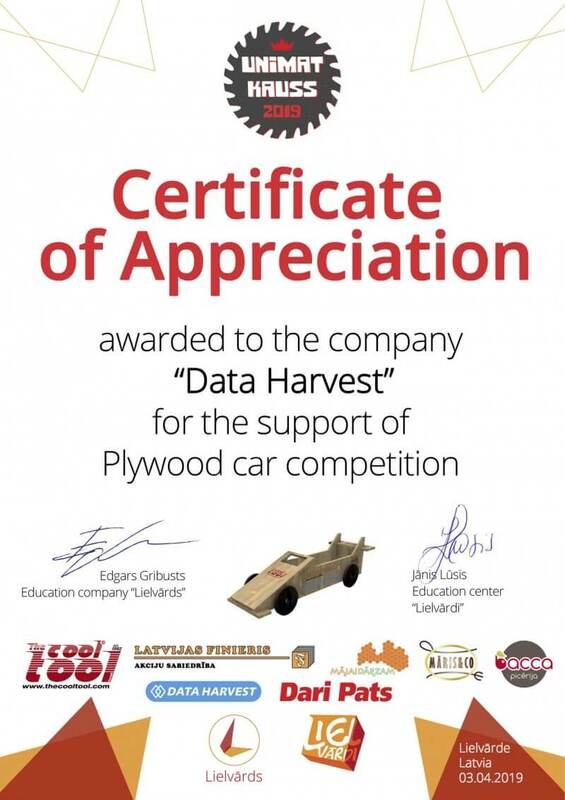 Data Harvest were please to support and sponsor the UNIMAT CUP 2019 competition in Latvia in April 2019, where Lielvarde Primary School won 1st place out of 7 teams from different participating Latvian schools. The main task was to produce racing-like models from one A4 plywood sheet, within three hours and to race the cars down a two-meter-long track three times. At the end of the race, the car's design, quality of execution and assembly, as well as the speed of the runway on a special track were evaluated. The time and speed measurements were taken using the Data Harvest Light Gates and the V-Log Data Logger to ensure reliable and repeatable results of the model construction and to mathematically find the winners. We would like to congratulate all 7 teams for their excellent designs and the winners Lielvarde Primary School.